Sump pump repair jobs can be required for a variety of reasons: Your sump pump has moving parts, it relies on electricity, and sometimes it may have to work pretty hard over an extended period of time if you have had a lot of rain. But, no matter the situation, Virginia Basement can handle your sump pump repair. It is entirely possible that your sump pump may need service without you realizing it. If you are unfamiliar with what a sump pump is or how it works, brushing up on this crucial basement appliance will help you determine whether yours needs work. Somewhere in your basement, you probably have what is known as a sump pit. A sump pit is essentially a hole in your basement floor that collects water to prevent your basement from flooding. The sump pit may be in a location where the water naturally flows to it, or it may receive water from other areas of your basement via a drain system. A submersible sump pump is one that operates inside the sump pit, under the water. If your basement has been finished and is used as a livable area, this type may be preferred since it is not as noticeable. Sometimes servicing a submersible pump may be more difficult since the pump itself is underwater. However, we are very familiar with how to handle these repairs. A pedestal sump pump, as the name implies, sits on a small pedestal located above the sump pit. Its motor, unlike the submersible version, should never come into contact with any of the water that is being pumped. At the bottom of the motor is a section of pipe extending to the bottom of the sump pit with a metal rod and attached float. During a dry period, there is no water to cause the float to rise. When water starts to accumulate in the sump pit, the float begins to travel up the metal pole. When it reaches a certain point, the float triggers a switch that turns on the motor. The water that is in the sump pit is sucked into the main pipe and sent out through another, away from your home. At least that’s the way it is supposed to work. 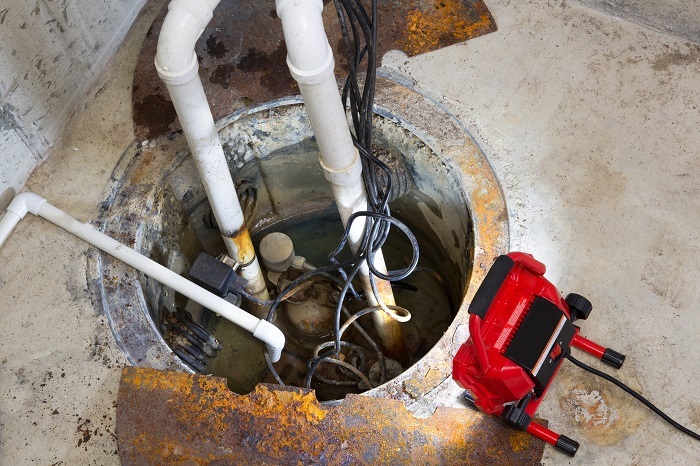 If you are looking for sump pump repair, then obviously something in your system is not doing its job correctly. In most cases, sump pump service will solve the problem, though it is occasionally more cost-effective to replace the pump entirely. At Virginia Basement, our professional technicians can help you determine the best method for repairing your sump pump. Air in valve: Your sump pump has a one-way valve that stops water from flowing back into the pump. Air in this valve can lock it up. Motor failure: The motor that does the actual pumping is a mechanical device, and they do wear out over time. A good one may last around 10 years, so if yours is older than that, you may just need to replace the motor. Float failure: If there is anything blocking the float from traveling up and down, the sump pump will never turn on. The float is a rather delicate device, so this is usually one of the first things we check on a sump pump repair call. If you suspect problems with your sump pump, contact Virginia Basement today. The problem your sump pump is experiencing cannot wait, so be sure to get it fixed before the next big rain to prevent your basement from flooding. We offer sump pump repair in Richmond, Virginia as well as Midlothian, Fredericksburg, Charlottesville, Williamsburg, Ashland, The RVA and Central Virginia.